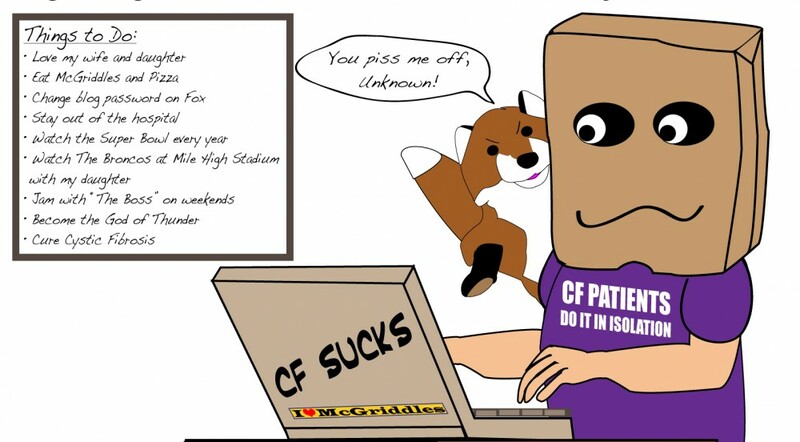 This entry was posted in cystic fibrosis, Fear and tagged cystic fibrosis, panic attacks by unknowncystic. Bookmark the permalink. I sure hope you feel better soon. I never want to see “I feel like giving up” in any of your posts! You WILL get through this! Thanks, Ginger. Feeling better today, but not 100%. Not sure what I reacted to. Scary. Appreciate the comment. it def sounds like a food allergy. had you eaten anything like strawberries, seafood, etc? also, sometimes antibiotics can react with dairy. I hope you are feeling better. Exactly, that I reacted to something. What? That’s the question. It’s strange how overwhelming and debilitating the attack was. When it happens I want it to end. Very strange. BTW, like the alliteration. CysticGal can comment clearly and concisely. Sorry you were feeling so bad. That sounds simply awful. Hope you figure out what triggered it. I think it’s bacterial. I was feeling better today, but then it hit again this afternoon with fever and chills and bloating. Could be c-diff. If not shaking this off by Wednesday next week will have an endoscopic test with the G-I specialist. Primary concurred that if no better after the ten days of doxy that I could follow with a levaquin course, sometimes it takes max power to handle the invasion. What a way to start spring and just when it is getting spectacularly loverly weatherwise. So sorry to hear you’re not feeling well. Sounds like everything hit at once. That’s the worst. And an endoscopy? I hope you shake it off and avoid that. I agree with “hanging in there” but I’ve not very patient and that’s what unravels me. I want to be well this minute. So, I won’t repeat the hang in there comment because I agree it does get old. Nice of you to visit again.